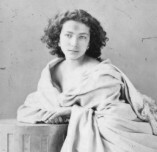 Generally accepted as the finest actress of the late nineteenth century, Sarah Bernhardt made her stage debut in 1862. Her reputation was established at the Odéon theatre, Paris between 1866 and 1872, and at the Comédie-Française, 1872 to 1880. From 1880 she toured the world with her own company, frequently appearing in her three major successes Phèdre, La Dame aux Camélias and Adrienne Lecouvreur. In 1897 she shocked the theatrical establishment by playing Hamlet in a new prose translation, repeating the role at the Théâtre Sarah Bernhardt, Paris, in 1899. It was in the duel scene from this production that Bernhardt made her screen debut, playing opposite Pierre Magnier in a short film made for the Phono-Cinéma-Théâtre in 1900. Under the influence of the dramatist Sardou she had developed a broad, pantomimic style of acting, much in evidence in her films La Dame aux Camélias (1911) and Les Amours de la Reine Elisabeth (1912). The scene from Hamlet was part of an extensive series of primitive sound films which provided a surprisingly wide coverage of the French entertainment world at the turn of the century. Opened on 8 June 1900 as an attraction in the Paris Exposition, the Phono-Cinéma-Théâtre in the rue de Paris was the brainchild of Clément-Maurice and Henri Lioret. Many well known actors and actresses, opera singers, dancers and music hall performers were persuaded to appear in short films which were synchronised with phonograph recordings, although in some cases the accompaniment consisted of sound effects or music rather than dialogue. Among the celebrities to be filmed were the famous French baritone Victor Maurel (1848-1923) singing arias from Don Juan and Falstaff; the ballerinas Rosita Mauri and Zambelli; Gabriella Réjane (1857-1920) from the Comédie-Française; the comic opera star Mariette Sully; and the dancer and courtesan Cléo de Mérode. The leading French actor Benoît-Constant Coquelin (1841-1909) appeared in the duel scene from Rostand's Cyrano de Begerac, a role that he had created in 1897. Among the variety performers to be included in the programme were the patriotic singer Polin; the internationally famous clowns Footit and Chocolat; and the English music hall performer Little Tich. 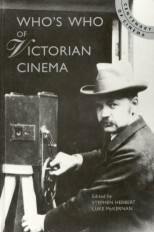 After the Exposition closed, the films were taken on a European tour by the cameraman Félix Mesguich, and in 1901 exhibited by the Isola brothers at the Olympia, Paris. They were rediscovered in 1930 and a selection reissued as Cinéma Parlant 1900 (1952).